A cursory review of history shows that at least from the time of the US Civil War in 1861, a temporary war tax or surtax was imposed by the president or by congress to pay for each American war. This includes the relatively insignificant Spanish-American War, when tariffs and other taxes were raised substantially, and temporarily, to pay for that little conflict. 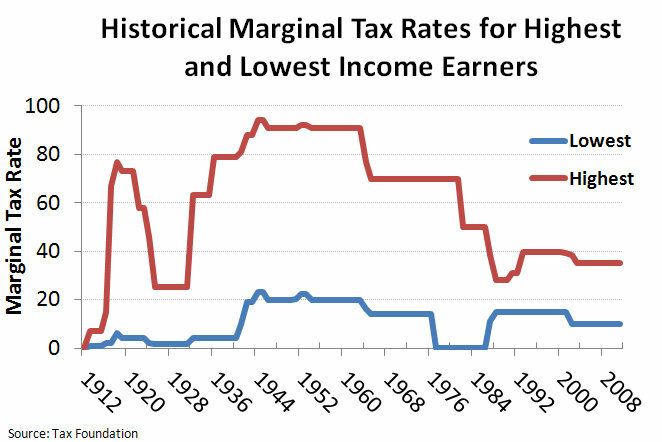 This chart shows that there were unusually high (for the times) marginal tax rates during the First World War. The top rate was increased to 91 per cent during the Second World War. The 91 per cent top marginal rate continued into the mid-sixties as we were still paying down WWII debts and paying for the Korean War. The term “surtax” is defined as an additional tax on something that has already been taxed; it is usually highly progressive, levied on the amount by which a person’s income exceeds a specific level. Collins English Dictionary, HarperCollins Publishers, 2009. At some point the surtax was dropped, yet to finish paying for Vietnam the top marginal rate of 70% was retained until about 1978, when Reagan wisely reduced the top rates. There was no radically unsustainable national debt from that time until George W. Bush came into office and failed to exercise the historical necessity of enacting a war tax after 9/11. Bush may have felt he had no choice but to stand good on his conservative campaign pledge to lower taxes, and that he was caught in a trap he could not get out of, even though the whole national situation had changed after 9/11. The Republican Party would turn against him if he did like his father and reversed his pledge of no new taxes. I’m sure he had advisors who were very familiar with history and who urged him imperatively to raise taxes to pay for the war, yet he didn’t have the guts to resolutely do what history called him to do: impose a war tax. So he ignored history, and by doing so lessened his stature as a world leader. He was not entirely at fault. He was capitulating to an increasingly business and wealth-oriented congress which had swung hard to the right. There are two major consequences in the years after 2001 and in the present day from George W. Bush’s failure to exercise exceptional leadership by imposing a war tax or surtax. The first is the horrific national debt our nation now carries. The second is the housing bubble and the recession of 2008. I will discuss each of these consequences separately, so that the cause and effect for each does not become conflated, and then suggest a present-day solution. Rick Seaman of Portland, Oregon, made this chart from data he found on TreasuryDirect.gov. “If voters don’t understand this, the media has failed them,” Seaman writes. This chart is not totally current, yet it illustrates perfectly the source of the current national debt. 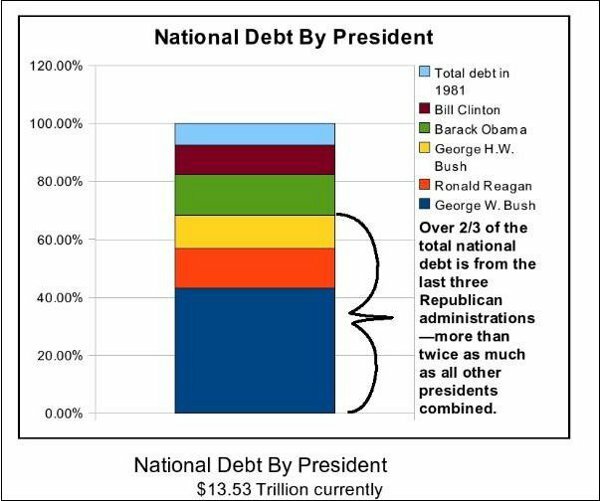 Obama has been forced to incur some more debt since this chart, due to the 2008 recession and its consequences, and his own unwillingness or inability to impose a war tax while the recession was in full swing. Still, if he hadn’t had to start from such a high base, the national debt as the wars were winding down would still be manageable in the present day. Had a war tax on high earners and corporations, along with a temporary surtax, been instituted in 2001, we wouldn’t have the problems we have today with owing so much money to the Chinese and the Japanese. We wouldn’t be paying so much interest on the national debt. Our country’s credit rating wouldn’t have been reduced due to unsound debt practices. Our nation would not be facing the beyond extreme pressures which make people wonder if those governing the country have good sense. We would be a more secure nation, well prepared to meet the challenges of the twenty-first century. The chart below shows that we’ve added nine trillion dollars to the national debt since 2001. 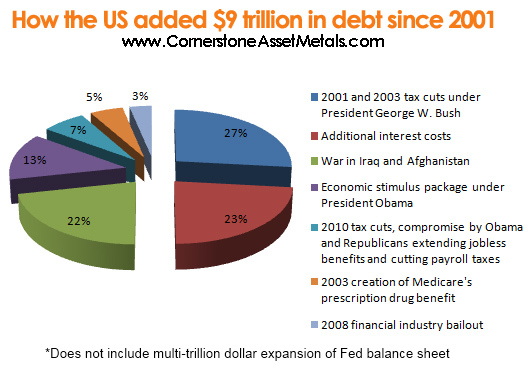 The chart clearly demonstrates that 49% of this added debt is due to the wars and to the Bush tax cuts. A lot more of the new debt is due to the increased interest costs of servicing the hugely out of proportion new debt. There is no need to say more. The evidence of the failure to embrace history speaks for itself. These tax cuts had the actual effect of placing $2 trillion more dollars directly in the hands of the top one percent and the corporations. It was a specific movement of money away from the government and into the open and willing hands of individual men and women in the private sector. The government made up for this transfer by borrowing against the credit of the nation. This movement of money into the private sector actually may not have been so bad had there not been a war going on all during this period of monetary transfer payments to the wealthy. These “transfer payments” to the wealthy were made especially and even more pronounced by the fact that the government was at this time borrowing to purchase war materiel and the daily goods needed by an army on foreign soil. Individuals and corporations were selling hundreds of billions of dollars’ worth of war goods to the government, thus greatly increasing their income and windfall profitability at the same time as they were receiving the transfer payments from the tax cuts. This tremendous increase in the number of dollars stacked up in the private sector cannot properly be called inflation. “Inflation” is a rigidly defined economic term which describes increases in the cost of living for consumers and a decrease in the value of the dollar; and is usually indexed by the Consumer Price Index (CPI). There is no evidence that the huge accretion of dollars has in any way reduced the purchasing power of the dollar, as is required for inflation. Inflation was controlled very well during this whole period of the Bush presidency. Yet there were trillions of additional dollars floating around in the pockets of the wealthy and in the banks. This increase in money floating around was not limited to the United States, yet the US has paid and is still paying a heavy present price for that gigantic increase. Since I can’t call this increase in total money “inflation,” I will suggest a new term to describe the increase: “accretion.” This marvelous accretion of the money available in the private sector meant that much of these extra trillions were, and still are, being handled by persons who were not really qualified to direct the investment and income opportunities such large sums bring on. There had to have been hundreds of thousands of people working to spread out these additional trillions so the owners of the money would be able to make a profit from investing their new wealth. Bankers and fund managers and mortgage brokers and others, many of whom were not really bright enough to find normal ways to invest. With so much money on the table, there was a lot of demand (money) chasing a limited supply of investments. Since the “accretion” which created this demand-pull situation did not deplete the purchasing power of the dollar, it cannot be said to be inflationary in the economic sense. Yet it did “inflate” the egos and sense of utility of those who were the beneficiaries of this accretion. So people who were never capable of handling such sums came up with creative ways to put the money out at interest. Sub-prime mortgages paid higher percentage rates than the traditional and stuffy collateralized loans, so the unqualified agents who set them up looked good to the owners of the money. Banks and other institutions which tried to remain “stuffy and conservative” found the accreted money being pulled out of their coffers and offered to those who were best at making promises to invest at a high rate, even without promises of adequate collateral or ability to repay. So it is actually beyond doubt that this almost unimaginable accretion of additional money in the hands inexperienced investors, or deposited in banks or other lenders who had to use agents who were inexperienced or overly creative, chased all kinds of bad investments and set the stage for the recession of 2008. Can We Solve This 12-Year Old Problem Now? So the government failed to enact a war tax back in 2001 and borrowed against the full faith and credit of the US to fund the Bush tax cuts. All that is over and done, so going back in time is not an option. What can we do going forward? Actually, we still have a war going on: the War on Terror and the war in Afghanistan. So Obama has also failed to enact a war tax after five years in office. So he should take the lead in getting a temporary war tax and surtax enacted now. The only genuine option to solve the larger problem is for congress and the president to get together now and put in place a temporary war tax and surtax today. Enact a 70% top marginal tax rate; increase the corporate tax rate, and then add a10% surtax on all income of any kind on top of that. Any such law MUST have as a part of it a guarantee that all funds collected from the increased tax will be paid against the national debt and used for no other purpose. One huge and messy problem that has always been a plague on the system is that when taxes are raised, the Democrats make every effort to introduce bills to increase government spending to absorb all the new tax revenues. Saying this is a little like saying that if you give a dog a bone he will want to chew on it. Increasing spending beyond current levels after enacting such a tax would be as much of a total disaster as the original Bush failure to enact a war tax. If the Republicans still want to be considered patriots, they will go along with such a proposal, with the understanding that wars must be paid for by the citizenry. If the Democrats still want to be considered patriots, they will agree to put in the tax bill that there will be no new spending from the temporary war tax and surtax. Managing the government in a responsible manner is really not much of a mystery. Congress and the president have to stand up to the pressures exerted by the influential and do what history has always asked our leaders to do: pay for our wars. This internet site has a whole lot great information on it, I verify on it each time Ia? ?m on the web. I want other web sites expended as considerably time as this one particular does generating details clearer to readers like myself. I recommend this website to all of my fb close friends. This website will make some huge passive revenue Ia? ?m positive. of Google while looking for a similar topic, your website got here up, it appears good. Hi there, just turned intfo aware of your weblog via Google, and located that it’s truly informative. you continue this in future. Numerous people will likely be benefited from your writing. or suggestions. Maybe you could write nextt articles referring to this article. Hello there, just changed into aware of your weblog thru Google, and located that it’s truly informative. Keepp up the good works guys I’ve incorporated you guys to my blogroll. this website dailly and get fastidious information from here daily. of all the internet users; they will take advantage from it I am sure. Wow, that was pretty interesting. Inspiring, as effectively. Many thanks for sharing this kind of inspiring knowledge with us. Wonderful blog, congrats!